Employees receive compensation from a company in return for work performed. While most people think compensation and pay are the same, the fact is that compensation is much more than just the monetary rewards provided by an employer. According to Milkovitch and Newman in Compensation, it is "all forms of financial returns and tangible services and benefits employees receive as part of an employment relationship" The phrase "financial returns" refers to an individual's base salary, as well as short- and long-term incentives. "Tangible services and benefits" are such things as insurance, paid vacation and sick days, pension plans, and employee discounts. An organization's compensation practices can have far-reaching effects on its competitive advantage. As compensation expert Richard Henderson notes, "To develop a competitive advantage in a global economy, the compensation program of the organization must support totally the strategic plans and actions of the organization." Labor costs greatly affect competitive advantage because they represent a large portion of a company's operating budget. By effectively controlling these costs, a firm can achieve cost leadership. The impact of labor costs on competitive advantage is particularly strong in service and other labor-intensive organizations, where employers spend between 40 and 80 cents of each revenue dollar on such costs. This means that for each dollar of revenue generated, as much as 80 cents may go to employee pay and benefits. Compensation costs have risen sharply in recent years, primarily because of escalating benefit costs. Employers now spend more than $1 trillion on employee benefits. In 2003 the Society for Human Resource Management reported that benefit costs averaged 39 percent of total payroll in 2001, up from 37.5 percent in 2000. This means that, on average, employers provide about $18,000 in benefits to each employee annually. The biggest cost increases have been in health benefits, which have been rising at an average of 12 percent annually for the past several years. An organization must contain these spiraling costs if it is to get a proper return on its human resource investment, and thus gain a competitive advantage. When compensation-related costs escalate, the organization must find a way to offset them. In the past, companies passed along these increases in costs to the customer in the form of higher prices. However, most U.S. companies now find it very difficult to raise prices. Thus, to remain competitive in light of fierce domestic and foreign competition, unfavorable exchange rates, and cheaper foreign labor costs, it is imperative that companies find ways to control labor costs. Unless this can be done, organizations may be forced to implement such adverse actions as pay freezes, outsourcing/offshoring, and/or massive layoffs. A host of laws such as the Equal Pay Act, Fair Labor Standards Act, and the Employment Retirement Income Security Act, regulate corporate compensation practices. Some pertain to pay issues such as discrimination, minimum wages, and overtime pay; others pertain to benefits, such as pensions, unemployment compensation, and compensation for work-related injuries. Organizations must understand and fully follow these laws in order to avoid costly lawsuits and/or government fines. Pay and benefits are extremely important to both new applicants and existing employees. The compensation received from work is a major reason that most people seek employment. Compensation not only provides a means of sustenance and allows people to satisfy their materialistic and recreational needs, it also serves their ego or self-esteem needs. Consequently, if a firm's compensation system is viewed as inadequate, top applicants may reject that company's employment offers, and current employees may choose to leave the organization. With the aging of the U.S. workforce and the impending retirement of the "baby boomers," employers must be more concerned than ever before about retaining skilled, productive workers. Moreover, disgruntled employees choosing to remain with the organization may begin to behave unproductively (e.g., become less motivated, helpful, or cooperative). Because compensation practices heavily influence recruitment, turnover, and employee productivity, it is important that applicants and employees view these practices in a favorable light. In the following section, we discuss how people form perceptions about a firm's compensation system and how these perceptions ultimately affect their behavior. One would expect that an individual's satisfaction with his or her compensation would simply be a function of the amount of compensation received: the higher the compensation rate, the greater the satisfaction. However, in reality things are not that simple. In fact, the amount of pay is less important than its perceived fairness or equity. To put this finding in perspective, consider the behavior of many professional athletes when negotiating a new contract. The average NBA salary in 2003 was $4.9 million; the average baseball salary was $2.4 million; the average NFL salary was $1.3 million. Yet, ball players continue to ask for more money. In many instances, these demands stem from neither need nor greed. Rather, the demand for greater salaries often stems from perceptions of inequity. For instance, despite a $15 million salary, a player may feel that his pay is inequitable because a less capable player (or someone he perceives as being less capable) is earning an equal or greater salary. Because equity is such an important concern, individuals responsible for developing a firm's compensation system need to understand how perceptions of equity are formed. Equity theory, formulated by J. Stacy Adams, attempts to provide such an understanding. The theory states that people form equity beliefs based on two factors: inputs and outcomes. Inputs (I) refer to the perceptions that people have concerning what they contribute to the job (e.g., skill and effort). Outcomes (O) refer to the perceptions that people have regarding the returns they get (e.g., pay) for the work they perform. People judge the equity of their pay by comparing their outcome-to-input ratio (O/I) with another person's ratio. This comparison person is referred to as one's "referent other." People feel equity when the O/I ratios of the individual and his or her referent other are perceived as being equal. A feeling of inequity occurs when the two ratios are perceived as being unequal. For example, inequity occurs if a person feels that he or she contributes the same input as a referent other, but earns a lower salary. For example, an assistant manager at a Wal-Mart department store might compare her pay to other assistant managers at Wal-Mart, to Wal-Mart employees in other positions (either above or below her in the organizational hierarchy), or to assistant managers at Kmart department stores. Decrease inputs by reducing effort or performance. Attempt to increase outcomes by seeking a raise in salary. Distort perceptions of inputs and/or outcomes by convincing themselves that their O/I ratio already is equal to that of their referent other. Attempt to change the inputs and/or outcomes of their referent other(s). For example, they may try to convince their referent other(s) to increase inputs (e.g., work harder for their pay). Choose a new referent other whose O/I ratio already is equal to their own. Escape the situation. This response may be manifested by a variety of behaviors, such as absenteeism, tardiness, excessive work-breaks, or quitting. While equity theory poses six possible responses to inequity, only two of them typically occur (namely, numbers 1 and 6). Research findings, for example, have linked underpayment to increases in absenteeism and turnover and to decreases in the amount of effort exerted on the job. These linkages are especially strong among individuals earning low salaries. Contrary to equity theory's predictions, these responses occur only when employees believe they are underpaid. Overpaid individuals do not respond because they feel little, if any tension, and thus have no need to reduce it. (The research findings on the issue of overpayment find overpayment to be either just as satisfying as equity, or somewhat dissatisfying but not nearly as dissatisfying as underpayment.) When feeling underpaid, why do some people choose to decrease their inputs, while others choose to escape the situation? A recent study sheds some light on this issue. The study found that reaction to inequity depends on the source of the comparison; people react differently depending on whether they judge equity on the basis of external (referents outside of the organization) or internal (referents employed by the individual's own organization) comparisons. When perceptions of inequity are based on external comparisons, people are more likely to quit their jobs. For instance, a nurse working for Hospital A may move to Hospital B if the latter pays a higher salary. When based on internal comparisons, people are more likely to remain at work, but reduce their inputs (e.g., become less willing to help others with problems, meet deadlines, and/or take initiative). To achieve internal consistency, a firm's employees must believe that all jobs are paid what they are "worth." In other words, they must be confident that company pay rates reflect the overall importance of each person's job to the success of the organization. Because some jobs afford a greater opportunity than others to contribute, those holding such jobs should receive greater pay. For instance, most would agree that nurses should be paid more than orderlies because their work is more important; that is, it contributes more to patient care, which is a primary goal of hospitals. For pay rates to be internally consistent, an organization first must determine the overall importance or worth of each job. A job's worth typically is assessed through a systematic process known as job evaluation. In general, the evaluation is based on "informed judgments" regarding such things as the amount of skill and effort required to perform the job, the difficulty of the job, and the amount of responsibility assumed by the jobholder. Job evaluation judgments must be accurate and fair, given that the pay each employee receives is so heavily influenced by them. Most firms create a committee of individuals, called a job evaluation committee, for the purpose of making the evaluations. Because those serving on the committee represent the organization's various functional areas, collectively they are familiar will all the jobs being evaluated. Such individuals typically include department managers, vice presidents, plant managers, and HR professionals (e.g., employee relations specialists and compensation managers). The committee chair usually is an HR professional or an outside consultant. Perhaps the two most serious problems with job evaluation ratings are subjectivity and the rapidity with which jobs fundamentally change, both of which can cause inaccurate and unreliable ratings. In order to minimize subjectivity, the rating scales used to evaluate jobs must be clearly defined, and evaluators should be thoroughly trained on how to use them. Moreover, the evaluators should be provided with complete, accurate, and up-to-date job descriptions. The second issue is more difficult to address. Due largely to changes in technology, jobs now change so rapidly and so fundamentally that evaluation results quickly become out of date. Job evaluation process is analogous to performance appraisal in that evaluators are asked to provide certain ratings on a form. Job evaluation ratings, however, focus on the requirements of the job rather than on the performance of the individual jobholder. Although several methods may be used to evaluate jobs, the most common approach is the point-factor method. 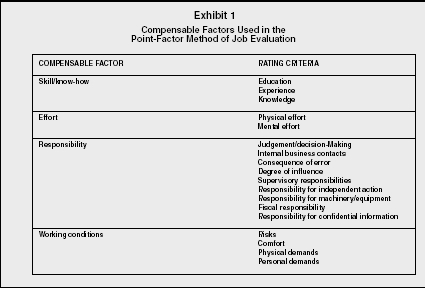 Using this method, jobs are evaluated separately on several criteria, called compensable factors. These factors represent the most important determinants of a job's worth. A list of some commonly used factors and the criteria upon which they are judged appear in Exhibit 1. Select and carefully define the compensable factors that will be used to determine job worth. Determine the number of levels or degrees for each factor. The only rule for establishing the number of degrees is that some jobs should fall at each level. Carefully define each degree level. Each adjacent level must be clearly distinguishable. Weight each compensable factor in terms of its relative importance for determining job worth. Assign point values to the degrees associated with each compensable factor. Factors assigned greater weights in Step 4 would be allotted a greater number of possible points for each degree level. When completing the job evaluation ratings, the evaluators use job descriptions to rate each job, one factor at a time until all jobs have been evaluated on all factors. They then calculate a total point value for a job by summing the points earned on each compensable factor. This approach to job evaluation is difficult and time-consuming. However, most organizations believe that it is well worth the effort. If properly conducted, the overall score for each job should reflect its relative worth to the organization, thus enabling the firm to establish internal consistency. When job evaluations have been completed, jobs are grouped into pay grades based on the total number of points received. Jobs with the same or similar point values are placed in the same grade. For example, consider jobs that are rated on a scale from one to one thousand. All jobs earning up to one hundred points could be assigned to pay grade one, jobs earning 101-200 to pay grade two, and so forth. Administrators use pay grades because, without them, firms would need to establish separate pay rates for each job evaluation point score. Once jobs are classified into grades, all jobs within the same grade are treated alike for pay purposes; that is, the same range of pay applies to each job in a grade. As companies develop pay grade systems, they must decide how many pay grades to establish. Most firms use thirty to fifty pay grades. However, some use as many as one hundred or more, while others use as few as five or six. The practice of limiting the number of pay grades eases the firm's administrative burdens. However, using a limited number of grades creates a situation in which jobs of significantly different worth fall into the same grade and receive the same pay. This outcome could lead to equity problems. For instance, registered nurses may feel underpaid if classified in the same pay grade as nursing aids. A firm achieves external competitiveness when employees perceive that their pay is fair in relation to what their counterparts in other organizations earn. To become externally competitive, organizations must first learn what other employers are paying and then make a decision regarding just how competitive they want to be. They then establish pay rates consistent with this decision. Following is an examination of how these steps are carried out. The firm begins by conducting or acquiring a salary survey. This survey provides information on pay rates offered by a firm's competitors for certain benchmark jobs (i.e., jobs that are performed in a similar manner in all companies and can thus serve as a basis for making meaningful comparisons). Some firms gather this information from existing surveys already conducted by others, such as those produced by the Bureau of Labor Statistics. Trade associations also conduct surveys routinely for their members, or companies may hire consulting firms to gather such information. Salary surveys conducted by others should be used when they contain all the information needed by the company in question. When no such surveys exist, companies generally conduct their own. After the pay practices of other companies have been identified, the organization must determine how competitive it wants to be (or can afford to be). Specifically, it must set a pay policy stipulating how well it will pay its employees relative to the market (i.e., what competitors pay for similar jobs). The determination of a pay policy is a crucial step in the design of a pay system. If pay rates are set too low, the organization is likely to experience recruitment and turnover problems. If set too high, however, the organization is likely to experience budget problems that ultimately may lead to higher prices, pay freezes, and layoffs. The majority of firms pay at the market rate, which is the rate offered by most of the competitors for labor. Those paying above market are referred to as "market leaders." These typically are companies with the ability to pay and the desire to attract and retain top-notch employees (e.g., "cream of the crop"). Those paying below market ("market laggards") generally do so because they are unable to pay higher salaries. Such companies often attempt to attract employees by linking pay to productivity or profits so that the employees can earn more if the company does well. When setting its pay policy, a company must consider its strategic plan. For example, if long-term employee commitment is a strategic goal, then the organization should attempt to develop compensation strategies that will enhance retention, such as establishing a generous retirement plan for long-service employees or adopting a profit-sharing system tied to tenure. Once market rates for jobs are determined and a pay policy is established, an organization must price each of its jobs. Since market rates identified by a salary survey usually are restricted to benchmark jobs, how do organizations determine these rates for their non-benchmark jobs? Using the data collected on the benchmark jobs, an organization would determine the statistical relationship (i.e., simple linear regression) between job evaluation points and prevailing market rates. This regression line is referred to as the pay policy line. The appropriate pay rates for non-benchmark jobs are set based on this line. Employee contributions equity is achieved when employees believe their pay fairly reflects their level of contribution to the organization. To achieve this aim, an organization must first establish a range of pay for each pay grade; it must then place each employee within that range based on his or her contribution to the organization. A pay range specifies the minimum and maximum pay rates for all jobs within a grade. When establishing pay ranges, most employers set the market rate at the midpoint of the range. The spread from the midpoint usually varies, becoming larger as one progresses to higher pay grades. Most organizations establish a range spread of 10-25 percent for office and production work, 35-60 percent for professional and lower-level management positions, and 60-120 percent for top-level management positions. The mechanism for recognizing employee contributions differs for new and existing employees. Contributions made by new employees are recognized by varying the level of starting pay they receive. New employees usually are paid at the minimum rate unless their qualifications exceed the minimum qualifications of the job. Those exceeding minimum qualifications are paid more because they can make a greater contribution, at least initially. Existing employees' contributions usually are recognized in the form of pay raises, typically granted on the basis of seniority and performance. Modern organizations are making very significant changes in their compensation systems in order to better fit the dynamic, highly competitive business environment. Firms increasingly are using things such as skill-based pay, which compensates employees for the number and types of skills they possess instead of the type of job they have. Similarly, there is a strong movement to "at-risk" compensation, where employee pay is tied to performance. Under this system, the employee's bonus does not become part of his or her base pay. Instead, the bonus must be re-earned each year. These changes, and numerous others, are designed to help offset compensation costs by gains in productivity, and to develop more flexible workforces. Adams, J.S. "Injustices in Social Exchange." In Advances in Experimental Social Psychology. 2nd ed., ed. Berkowitz. New York: Academic Press, 1965. Henderson, Richard I. Compensation Management in a Knowledge-Based World. 9th ed. Upper Saddle River, NJ: Prentice Hall, 2003. Mathis, Robert L., and John H. Jackson. Human Resource Management. 11th ed. Mason, OH: Thomson/South-Western, 2006. Milkovich, George T., and Jerry M. Newman. Compensation. 8th ed. New York: McGraw-Hill/Irwin, 2005. U.S. Department of Labor, Bureau of Labor Statistics. "Compensation and Working Conditions." Available from http://bls.gov/opub/cwc.